One of the most important things when it comes to goldfish care is to have optimal aquarium water conditions. Doing so will ensure your goldfish are happy and healthy. The following are the main things you should be concerned with when it comes to water parameters. You should use cooler water around 70*F (21*c). Goldfish can live safely in waters that are between 55-80F. Lower than 50 and higher than 85 are the danger zones and these temperatures can kill your goldfish. Some goldfish can survive in ponds down to a few degrees about freezing 32F. Some goldfish pond owners have claimed to have their ponds frozen over and they survived. On the other extreme, they can survive in temperatures as high as in the mid 90s but only for a short time. The most common cause of death when it comes to water temperature for a goldfish is rapid changes in temperature. The water should have neutral pH of 7 or a pH that the bowl presently has. They can live happily in water with a pH of 6-8.5 pH but they don’t do well when the pH is changed to quickly. Buy a test kit to check your tank’s pH level and the water you plan on using to replace it with. See more on Adjusting Aquarium pH. The tank water should contain no chlorine or chloramine. If you use tap water, let it sit over night to allow the chlorine to evaporate or get aquarium dechlorinator drops to treat the water. If you don’t know if you tap has chlorine, if you get your water from the city, it will more than likely have it. As your fish lives in its bowl or tank, it will go about eating as well as producing waste. This will change the chemistry of the water. Ammonia will build up and can kill a fish if these levels get too high. See goldfish ammonia poisoning below for additional information. You can test the tank water for ammonia using an ammonia test kit. If the levels are high, it’s time to change the dirty water. If you get your water from a municipal water source, ie, from a tap or a garden hose, it will no doubt have some trace of chlorine or chloramine in it. When you initially set up your goldfish tank or pond, you might have no other choice than to use this water. Now, the best thing you could do is to fill up your tank or pond and let it sit for a day or two to allow the chlorine to evaporate. This technique can also be done when you do a 20% water change of your goldfish aquarium. This solution is free but only works to eliminate chlorine not chloramine. Chlorine is volatile and evaporates quickly while chloramine is not volatile and does not evaporate quickly. You should use a Water dechlorinator but not just any dechlorinator. Using a plain dechlorinator might neutralize the chlorine but leave the chloramine. Check to find out what your municipal water source contains, but, be aware that they might switch back and forth using both chlorine and chloramine. Be on the save side, use an aquarium dechlorinator that eliminates both. Be careful not to get caught up into buying a fancy high end aquarium dechlorinator, as you might not need everything it has to offer. Using one that has an ammonia remover can screw with your tanks biological filter. You can eliminate ammonia in other safer ways. It is important that you follow the instruction carefully and only use the recommended dosage since overdoses can build up in your goldfish pond or tank and potentially kill your goldfish. The term new-tank syndrome refers any goldfish tank that has not fully cycled its nitrogen cycle. Ammonia levels become dangerously highly in a goldfish tank with new-tank syndrome. New-tank syndrome occurs in a newly setup goldfish tank or a tank that has been completely cleaned top to bottom and then goldfish are introduced. These tanks lack beneficial bacteria that convert toxic ammonia into nitrites and less harmful nitrates; ammonia that the goldfish produce .It takes 2-6 weeks for a tank to cycle and the ammonia level spike to drop to safe levels. It is best goldfish care practice to set up a new goldfish tank and let it run for 2-6 weeks before any goldfish are added. To avoid new tank syndrome add a gravel substrate, fill the tank with clean dechlorinated water and run the filters during those 2-6 weeks. Beneficial bacteria will begin to grow in the filter media and in the gravel substrate. Beneficial bacteria will grow naturally but can also be purchased to speed up the process. An established goldfish tank should never be completely clean or a 100% water change performed since it would eliminated the beneficial bacteria that is critical for a properly functioning nitrogen cycle. Routine maintenance and regular water changes are the best way to achieve optimal water conditions but any filters and gravel substrate should never be washed with water that isn’t from the goldfish tank. (clean gravel substrate). Water changes should be no more than 75% but no less than 20%. A water change is the easiest and safest way lower elevated ammonia levels by removing the ammonia from the tank water. Use an ammonia test kit to track ammonia levels in a goldfish tank before introducing the goldfish to avoid becoming a victim of new-tank syndrome. Ammonia poisoning is the result of elevated levels of ammonia in the goldfish tank water. Ammonia is introduced into the goldfish tank water by every goldfish that lives in it. 25% of it is produced by goldfish waste but the majority of it, %75, is secreted through osmosis in the gills. Ammonia moves from a high concentration in the goldfish to the low concentration in the tank water. When the concentration in the water builds to a higher level than the goldfish, the goldfish stops secreting it. With out this secretion, the goldfish will begin to suffer from ammonia poisoning. Symptoms of ammonia poisoning include redness in the skin (ammonia burns), excessive mucus production, loss of appetite, clamping of fins, and inactivity. These symptoms are common in other types of goldfish illnesses so it is wise to do an ammonia test to accurately diagnose goldfish ammonia poisoning. High levels of ammonia are more problematic in a new not yet cycled tank that hasn’t had the chance to grow beneficial bacteria for use in its biological filter. This is often called ‘new tank syndrome’. Ammonia spikes also occur when new goldfish are introduced into a cycled tank that have a zero ammonia level reading. That is why it is recommended to only ad a goldfish at a time; so your biological filter can keep up with the new stock levels. If you notice these symptoms and find that your ammonia levels are high, do a 50-75% water change and add a biological aquarium supplement to up your levels of beneficial bacteria. Consider lowering your stocking levels and reduce excess feeding. 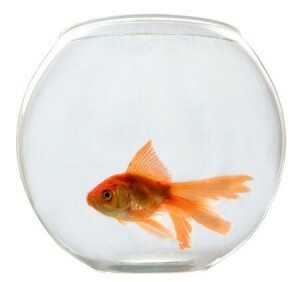 A small goldfish bowl or an aquarium less than 10 gallons will require a water change several times a week if not daily to avoid ammonia poisoning of the goldfish. Cause: Nitrite poisoning often occurs after ammonia poisoning. Nitrite is absorbed into the goldfish through its gills and then attaches to the red blood cells in the goldfish’s blood stream. This condition called met-hemoglobinemia or ‘brown blood disease’, makes the blood cells unable to carry oxygen. The goldfish will eventually suffocate and die from a lax of oxygen. Goldfish that are exposed to even low levels of nitrite can make them more susceptible to other disease like ich fin rot or bacterial infections. Symptoms: The symptoms of nitrite poisoning include: listlessness, gasping at surface, brown gills, rapid gill movement, brown blood and upon death, the goldfish will have flared gills. Cure: Reduce the nitrite levels in water by reducing feeding for the time being and removing goldfish waste, debris and materials that contains nitrogen. Preform a large water change of 50-75%. Adding a .03% aquarium salt solution will inhibit nitrites from absorbing into the goldfish through its gills. Make sure the goldfish tank is well oxygenated by adding an air bubbler or airstone. Prevention: Add new fish slowly, keep waste and debris out, preform routine water changes. Cause: High levels of nitrates in the water gets absorbed through the gills. This occurs in new tanks that have not cycled yet or when new fish are introduced. Symptoms: High nitrate levels cause blood vessels in the fins and skin to become dilated making the skin to appear streaky, Inactivity, listlessness, loss of appetite Goldfish exposed to low levels of nitrates over an extended period have a lower immune system, making them more susceptible to other goldfish illnesses like ‘flipover’. Cure: Work at getting nitrate levels below 50ppm by adding aquatic plants, allowing some algae to grow, and doing routine water changes. Prevention: Allow the biological cycle to become established and add new fish slowly. Remove any waste and debris from the goldfish tank and preform routine water changes. In order to thrive, a goldfish requires a good amount of dissolved oxygen in its tank water. When oxygen levels in a goldfish tank are low, goldfish can suffer from oxygen deprivation, leading to the death of the goldfish. The most noticeable symptom of oxygen deprivation is a goldfish that gasps for air near the surface of the water. That being said, goldfish with certain goldfish parasites or suffering from other poor water quality issues like a pH crash include gasping as a symptom. By testing for dissolved oxygen, oxygen deprivation can be diagnosed or excluded as the cause for this symptom. Cold water contains more oxygen than warm water and thus cooling the goldfish tank water is the first step to increasing dissolved oxygen in the water. In an aquarium, the heater should be turned down to under 70*F and the tank should moved out of any direct sunlight. In a outdoor goldfish pond during summer months this can a difficult task. Aside from adding temporary plants next to the pond or floating aquatic plants in it to add shade, or even placing frozen water filled milk cartons, there little to be done to drop the temperature. Floating plants might provide shade and lower the water temperature which will increase dissolved oxygen in the water but the fact of the matter is, by adding aquatic plants during this time will actually lower the dissolved oxygen for two reasons. The first is that aquatic plants take in oxygen at night and will compete the goldfish for oxygen. This is the main reason for any fish loss over night during warm periods. The other reason is that floating aquatic plants lower the surface area of the water surface lowering the amount of oxygen that can mix with the water. Instead of adding more aquatic plants, run all fountains and waterfalls overnight 24/7 to keep higher levels of dissolved oxygen in the goldfish pond water and run air pumps and airstones in goldfish aquariums 24/7. Keep lower stocks of goldfish and feed them less. For up to a few hours after feeding, a goldfish’s demand for dissolved oxygen can be double. In an emergency, where goldfish are suffering from oxygen deprivation, add hydrogen peroxide. Use a spray bottle that contains a .03% USP solution and direct the spray down into the water; no more than one squirt for every gallon of water. An overdose can burn the skin of the goldfish. Goldfish can survive in a wide range or water temperatures but at the high and low extremes, the health and happiness of your goldfish diminishes. At very cold temperatures, goldfish go into semi hibernation, sit at the bottom and don’t eat much. This is not life threatening to the goldfish and they tend to bounce back when the water temperatures rise again; like when spring arrives to your outdoor goldfish pond. However, turning off a goldfish pond’s waterfall or fountain will help keep cold water from being cooled by outside air that can be much colder than the water itself. It also helps keep the colder water near the surface from mixing with the slightly warmer water at the bottom, hence why the goldfish stick to the bottom. In a goldfish tank or small pond, It’s an easy fix to adjust your goldfish’s water when its water is on the colder side; you simply add a heater and the water temperature rises. These heaters can come in designs like aquarium glass mounted or under gravel. Goldfish can survive in warmer water but there is less oxygen in warmer water, increased bacteria growth and goldfish are more susceptible to becoming sick. Cooling the water temperature in a pond or tank that is too hot (over 85-90*F) is a little more tricky than heating the water. First it’s important to run all the fountains waterfalls, or air bubblers to maximize oxygen in the water. Next, if it is possible, move the goldfish tank or pond out of any direct sunlight. If that is not possible, try adding some temporary plants to shade the water. If none of that lowers the water temperature enough, fill up some plastic milk jugs or soda bottles, freeze them and then place them in the goldfish water. They will slowly unfreeze and hopefully drop the water temperature. thank you for the information………….having a problem with our gold fish in our pond. We recently removed our Goldfish from the pond & put them into a tank while we changed the water & cleaned out the pond. While they were in the tank they produced a large number of what looked like eggs & the water in the tank became very discoloured. After cleaning out the pond it was refilled with tank/rainwater & the fish were put back in with the water & eggs from the tank. The water in the pond became very discoloured after a week & the some of the fish died. Any idea what the cause is? We have changed out the pond water on numerous occasions without any problems.